From Frank Sinatra to Frank Ocean, David Redfern&apos;s photography captures popular music&apos;s revolution: the period that carried us from mid-century jazz and swing to today&apos;s world of rap and indie rock. Last week, at the age of 78, he died from pancreatic cancer. But Redfern&apos;s legacy will live in his art. As one of the most iconic music photographers of all time, he captured practically everyone, including Jimi Hendrix, B.B. King, Bob Dylan, Duke Ellington, Eric Clapton and Aretha Franklin. Viewing his photos is watching a visual history of our culture&apos;s greatest music. And, they&apos;re easy to find in the Redferns Music Picture Library, which Getty Images acquired in 2008. It remains as one of the most comprehensive music photo libraries online and features images of more than 26,000 musicians from hundreds of photographers. Circa 1960: Tony Bennett sings a live performance in the U.K.
Circa 1960: T-Bone Walker plays at the Hammersmith Apollo in London. December 1963: A young Stevie Wonder sings in-studio at Television House on Kingsway in London. October 1964: George Harrison, John Lennon and Ringo Starr on the set of Shindig!, an American music variety show hosted on ABC. January 1965: The Rolling Stones on set for the British TV show Thank Your Lucky Stars. August 1967: A ponchoed Eric Clapton is seen offstage at the National Jazz and Blues Festival in England. Clapton was performing at the festival with his band, Cream. Redfern also photographed Jack Bruce, Cream&apos;s bassist, who died Saturday at the age of 71. September 1967: John Lennon poses during filming of the Beatles&apos; Magical Mystery Tour. September 1967: The Beatles pose for a group shot, sitting on the grass at Plymouth Hoe and looking out to sea during their filming of Magical Mystery Tour. Circa 1968: Nina Simone pauses during a taping for the BBC. 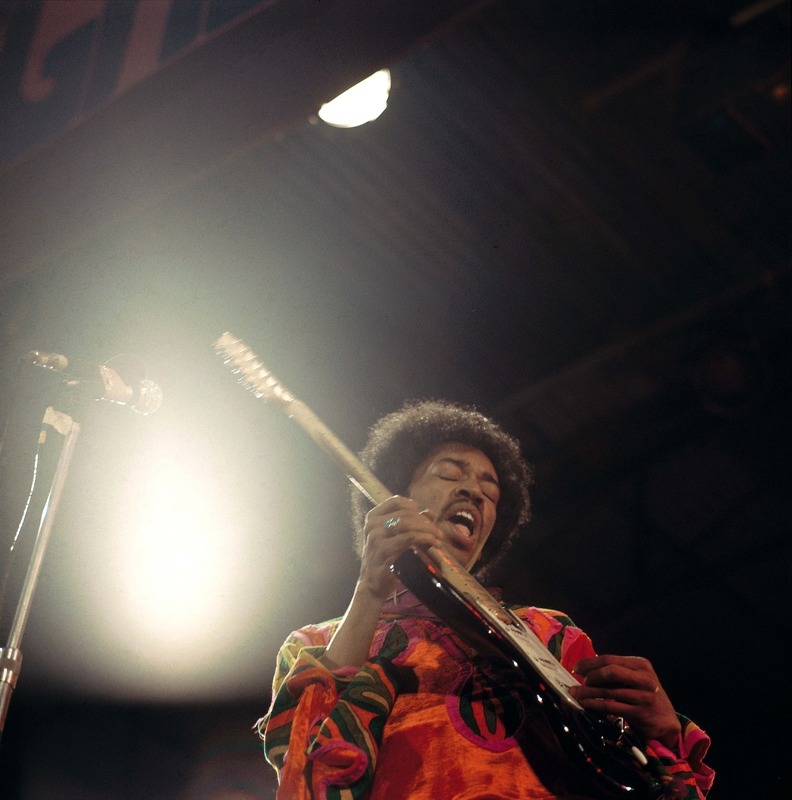 February 1969: Jimi Hendrix performs on stage at the Royal Albert Hall in London. August 1969: Bob Dylan performs onstage at the Isle Of Wight Festival in England. July 1970: Ella Fitzgerald performs onstage at the Newport Jazz Festival in Newport, Rhode Island. March 1971: Mick Jagger and the Rolling Stones perform at Colston Hall in Bristol, U.K.
July 1972: B.B. King at the Newport Jazz Festival in Newport, Rhode Island. 1973: Duke Ellington directs his big band on a BBC television show. December 1973: Elton John performs at the Hammersmith Apollo. April 1975: Emmylou Harris performs onstage at the Country Music Festival at Wembley Arena, London. September 1976: Marvin Gaye performs on stage at the Royal Albert Hall. "My favorite artist was Marvin Gaye," Redfern once said. "But he wasn’t easy to photograph. He had all these wonderful arm movements." September 1978: Blondie perform onstage at the large Hammersmith Apollo venue. November 1978: Dolly Parton performs onstage at Hammersmith Apollo. Circa 1980: Frank Sinatra performing onstage. May 1984: Cyndi Lauper performs at the Montreux Rock Festival in Montreux, Switzerland. March 1985: Tina Turner performs at the Brighton Centre in Brighton, U.K.
March 1988: Willie Nelson sings at the Wembley Arena. April 1994: Aretha Franklin performs at the New Orleans Jazz and Heritage Festival in New Orleans. 1995: Famed jazz pianist Dave Brubeck looks up during a rehearsal in London. May 1996: Dave Matthews performs onstage at the New Orleans Jazz and Heritage Festival. July 2011: Macy Gray gathers herself at the Scene Massena during the Nice Jazz Festival in Nice, France. June 2012: Erykah Badu performs at Theatre Antique during Jazz à Vienne 2012 in Vienne, France. May 2013: Frank Ocean performs onstage at the New Orleans Jazz and Heritage Festival. May 2013: Adam Levine of Maroon 5 onstage at the New Orleans Jazz and Heritage Festival. July 2014: Joss Stone performs at a festival in Juan-les-Pins, France.